At the 2017 Academy Awards Sunday night, host Jimmy Kimmel used the Oscars stage to take digs at President Donald Trump — and occasionally to talk about this year’s nominees. During the show, Kimmel — in his first gig at The Dolby Theatre in Los Angeles — spent the majority of his time wryly alluding to Trump and trying engage him in a social media battle. At one point, Kimmel sarcastically trash-talked Meryl Streep before calling out a “totally undeserved round of applause” for her. The bit was presumably a response to Trump’s January tweet against Streep after she gave an anti-Trump speech at the Golden Globes. When Trump’s social media continued to be silent during the show’s first two hours of jabs and jokes, Kimmel even live-tweeted the president onstage. In a rare display of what might have been self-control, Trump didn’t take any of Kimmel’s bait. Although Kimmel did a better job buoying the live entertainment than Justin Timberlake’s opening performance of “Can’t Stop the Feeling,” his messages of unity and punchlines about Trump felt less genuine than the continuation of his long-standing feud with Matt Damon. Early on, viewers heard an unavoidable joke about “The Great Wall,” followed by Kimmel teasing Cameron Crowe’s “We Bought a Zoo.” Kimmel parodied the film in a bit introduced this year in which presenters discuss their favorite movies while reacting in a theater setting to certain scenes. 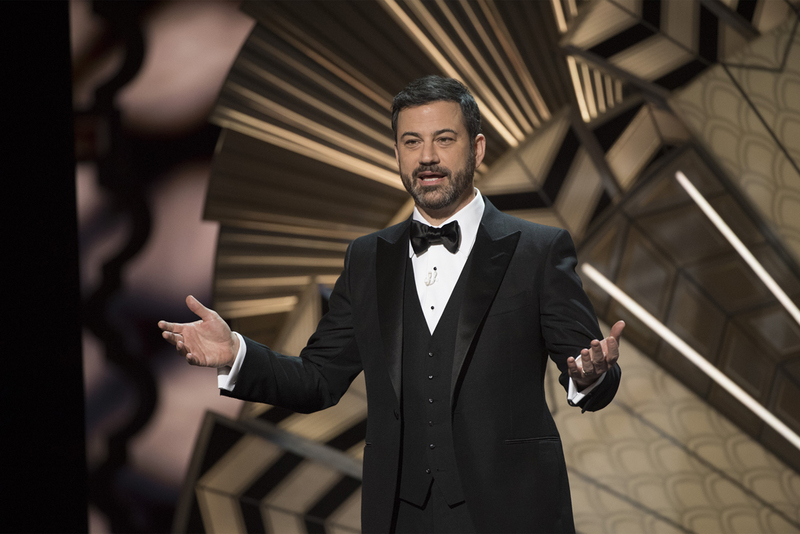 Kimmel’s monologue reached for the low-hanging fruit of political blows and cheap laughs, and his material took relatively little time to discuss the nominated films. The talk show host used the Oscars stage not to explore new material related to the people gathered in the room, but to recreate the monologues he regularly makes on his show. Kimmel could have instead used the time to either discuss the films themselves, or to bring attention to issues within the Academy itself — like last year’s #oscarssowhite controversy, which Kimmel mentioned only in passing. “Remember last year when it seemed like the Oscars were racist?” Kimmel asked the audience. Some of the winners did take their time in the spotlight to advocate for social and political issues and made bigger waves than Kimmel managed. For instance, the leads of “Hidden Figures” brought out the real-life Katherine Johnson — portrayed by Taraji P. Henson in the film — as they presented the award for Best Documentary. Then, Ezra Edelman — whose film “O.J. : Made in America” won Best Documentary — dedicated his award to victims of racial violence. Similarly, director and two-time winner Asghar Farhadi — whose Iranian film “The Salesman” won Best Foreign Language Film this year — tweeted last month that he would boycott the Oscars following Trump’s travel ban. And he did. His absence from the show left viewers to consider the impact of anti Muslim sentiment, as well as the legislation Trump has rolled out in recent weeks. A sharp change from last year’s #oscarssowhite debacle, two of the acting trophies went to black actors. Best Actress in a Supporting Role went to Viola Davis for her powerful performance in “Fences” as a struggling mother and wife in 1950s Pittsburgh. Davis gave a lengthy and emotional acceptance speech, mostly spoken through tears, akin to her own performance. More subdued in reaction in his win, Best Actor in a Supporting Role went to Mahershala Ali for his memorable role as a father figure and drug dealer in “Moonlight.” Along with its surprise Best Picture win, the film also won Best Adapted Screenplay for three coveted awards. These accolades were very much deserved, resulting from the hard work and talent of both Davis and Ali — but don’t get the Academy off the hook for the #oscarssowhite controversy. The Academy’s results are intrinsically linked to the social state of Hollywood. Without diversity in the casting of films to begin with, there certainly won’t be any diversity on award nights. The continued issue of underrepresentation of people of color Sunday night, then, can be traced directly back to the selections that Hollywood directors make when they’re choosing their cast and crew. If #oscarssowhite is ever going to be reversed, it has to start with increased representation of minorities in all roles of film production. This is a social justice topic that Kimmel could have touched on with more impact than his repeated soft blows at the presidency. Ultimately, “Moonlight” deserved the three awards it came away with — including the win for Best Picture that was mistakenly and temporarily awarded to “La La Land” in an envelope mix up. “La La Land,” as a result, did not dominate the evening as expected following its record-tying 14 nominations. The film still received six wins, including Best Director for Damien Chazelle, making the 32-year-old the youngest director to win the award. As one of many splits between Best Director and Best Picture in recent years, this year has two of the strongest films you could hope would receive such attention. While Kimmel’s jokes were topical, didn’t matter half as much as the socially and politically focused speeches of the winners. Kimmel’s jokes also didn’t hit hard enough to send an actual message, relying instead on tired references to Trump’s Twitter presence. Next year, maybe the Academy will find a host willing to breach new subject matter.